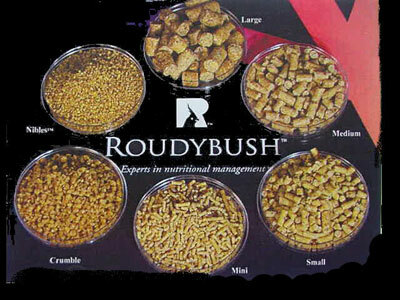 Roudybush Low Fat Bird Food 44Oz. Premium bird food for your valuable pet! Your small to large sized birds will enjoy great taste and nutrition from this low-fat maintenance diet. Roudybush Low Fat Daily Maintenance Diets are specially steam pelleted to retain beneficial nutrients while eliminating harmful bacteria. Contains 12% protein, 3% fat. Please specify Lowfat Crumbles (for small birds) or Lowfat Medium (for large and medium-sized birds).